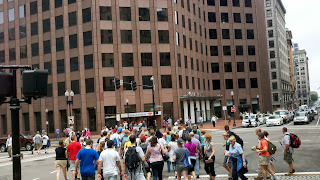 The Old State House is where the British Government held its sessions in Boston back in the 18th century. 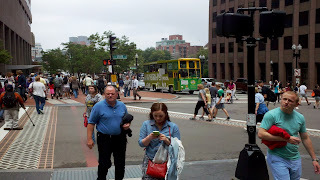 Today, it's part of the Freedom Trail in Boston and it is also the State Street Subway Station (under the State House). How the built the subway station under a historical place like this is amazing to me, but that's another story. Of relevance to me is that the intersection is a amazing number of streets coming together and a good example of a pedestrian scramble. 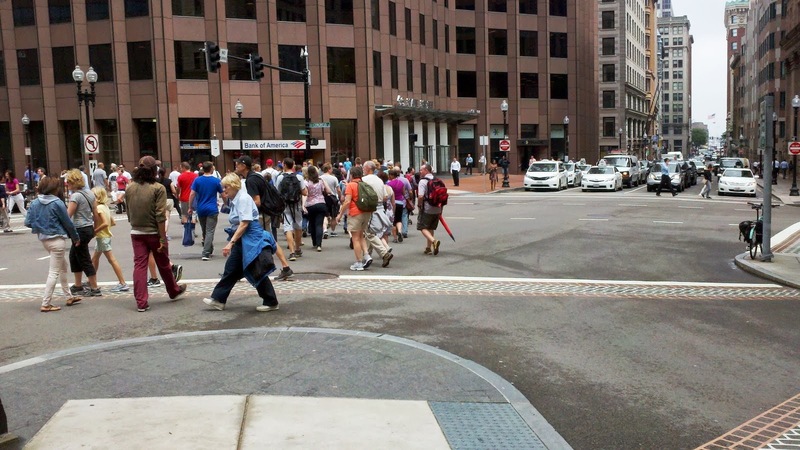 I am not a strong proponent of the Barnes' Dance (as they are also know), but this is a great example of where it makes a lot of sense because of the intensity of pedestrian traffic, the interest in crossing the street in so many different directions and it is the "there" there. Pedestrian safety is the highest priority and in this case with all of the potential for conflicts between pedestrians and right turning traffic, this is a great solution to a relatively unique problem. The subway also brings a heavy peak flow from the transit station to the surrounding area when a train arrives in the station. I would imagine in the morning that this place is active with a lot of people hustling to work. The other reason this makes a lot of sense is the extent of tourist traffic. 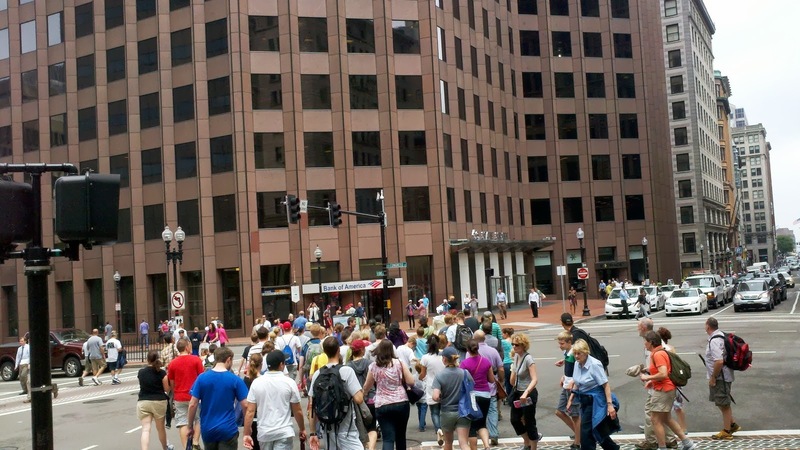 The number of tourists in this part of downtown Boston suggests another reason to use the pedestrian scramble. 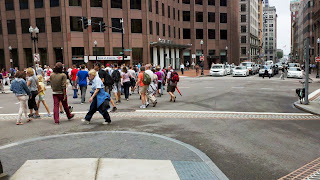 In general, pedestrian scrambles can result in higher delay for people walking (and others) because of the time necessary to separate the movements.